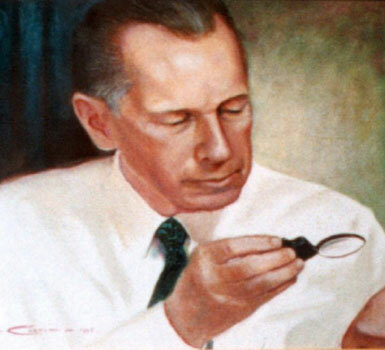 An entrepreneur, scientist, and educator, Dr. Lee was committed to communicating advances in nutritional science to medical professionals, food manufacturers and the public at large. Born in a small farming town in Wisconsin in 1895, Lee was a child with a tremendous desire to learn. As he grew he became an avid researcher and devoured books on inventors, science and chemistry. He wrote journals and made lists of biochemistry and nutrition definitions. Fascinated with how the body worked, he studied the endocrine and immune systems and how they affect health. He became well versed in biology. Driven to learn, Lee taught himself physics from his older sister’s schoolbooks. He was later asked to teach his high school physics class. After high school, Royal Lee found jobs working with farm machines, cars and motors. In 1918 he married; soon after, he was called to military service. In his 20’s, Lee was hired by a company to repair complex electrical equipment. He became extremely interested in a dental drill motor that needed a redesign. Lee realized that to understand this drill, he needed to think like a dentist and enrolled in the Marquette University School of Dentistry in the early 1920’s. While at school, he developed dental drill prototypes and eventually designed the centrifugal governor that measured and regulated the speed of small motors. Dr. Lee’s governor addressed a then-long-standing problem of accurately controlling motor speeds while under load. He was awarded a patent for this novel invention, which was the basis for incorporating the Lee Engineering Company. Lee Engineering governors were produced at a fraction of the cost of other governors, which led to their widespread use in home appliances, aircraft, ships, motion picture equipment, adding machines, typewriters and manufacturing equipment. Dr. Lee’s success in governed controls was the catalyst that supported his interest in nutrition and biochemistry. Other products based on Dr. Lee’s work inventions followed: the Lee Household Flour Mill, the Lee Liquidator (to puree foods), the Pexton Press (to extract juice from puree), a variety of footswitches for scientific and industrial applications and lattice apparatus systems. Throughout his life, Lee acquired nearly 100 patents in the areas of electro-mechanical devices, food preservation and processing, scientific apparatus, automotive, and medical devices. In 1941, Dr. Lee organized the Lee Foundation for Nutritional Research. The goal of the foundation was to address nutritional challenges and educate people about the importance of proper nutrition. Under the auspices of the foundation, Dr. Lee published countless works of research on the topic of whole food nutrition and its positive effect on health and wellbeing. Dr. Lee felt that there is an enormous benefit to eating whole, unprocessed foods. Dr. Lee’s systems thinking approach to biologic networks asserted that a vitamin is not a single compound, but a group of interdependent compounds. He also stated that these compounds form a “nutrient complex” so intricate that only a living cell can create it. The Lee Foundation for Nutritional Research published several writings focusing on the beneficial nutrient complexes in butter, brown rice, oats, barley, rye, barley, corn, bread potatoes, sauerkraut, and flour. As a leading critic of commercially produced flour; Dr. Lee developed his home flour mill as a way for average Americans to derive the optimal nutritional benefit in whole wheat flour. The current Lee Household Flour Mill is the direct descendant of that original mill, with some modern improvements. Dr. Lee created new techniques to prepare vitamin and mineral concentrates that retained the vital factors found in food. Many unique formulas followed. As time went on there was more acceptance of nutritional supplementation and many of Dr. Lee’s ideas became widely accepted. Today, we can recognize his legacy and the importance of nutrition and holistic engineering. Dr. Lee is viewed as a trailblazer in the nutrition and health movement and his company, Standard Process, Inc., continues his mission to provide whole food nutrient solutions.